Pinterest is the world’s catalog of ideas. Their stated mission is to, “help people discover the things they love, and inspire them to go do those things in their daily lives.” In its basic form, it’s a collection of images grouped by subject “boards” and curated by it’s users. While a lot of users are “mommy bloggers” and are uploading recipes and pictures of arts and crafts that they are making, it’s also a serious place for businesses and marketers to get some great inspiration and even expand awareness of their brands. As content marketing has become more widely accepted over the years, companies both large and small have been using infographics and images to provide information about their products, services or the industries they serve. Most of these infographics live exclusively on a company’s website, and that’s the only place you can find them. For many companies, when you factor in the number of website visitors they get on a monthly basis and the number of visitors that stumble upon their infographic, you could almost say that they are hiding their infographic from the public. If very few people find your infographic, you are surely not getting as much out your investment in developing the infographic as you could. 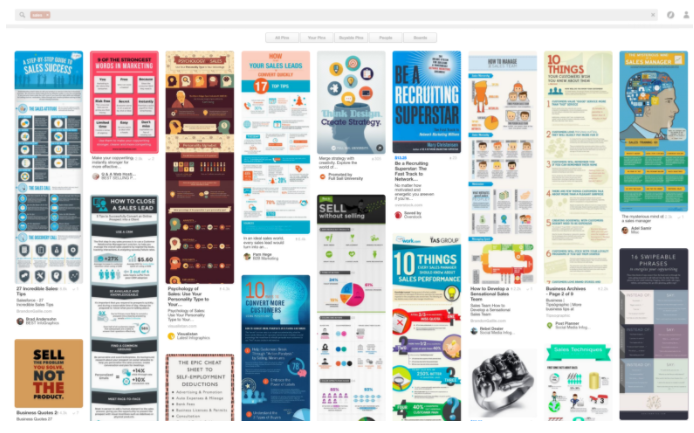 For companies that want to have increased visibility on their infographics and to establish thought leadership with their content, posting your infographics to Pinterest is an excellent way to get more eyes on your content. This not only generates more views of your content, but it can also drive visits to your website as you can include a URL with the image as well. Pinterest has become a great resource for exploring and learning more about a wide array of topics of interest to B2B Marketers and salespeople. Some of the most popular infographics relate to motivation, leadership, sales processes and sales techniques.